This Helium Balloon Plastic Plate Scan Hook is all the componentry necessary for sale of light Foil and Latex Balloons via vertical Pegboard Merchandiser panel. The front Plastic Plate accepts self-adhesive labels, though retrofit of extruded plain-paper label holders is a possibility. 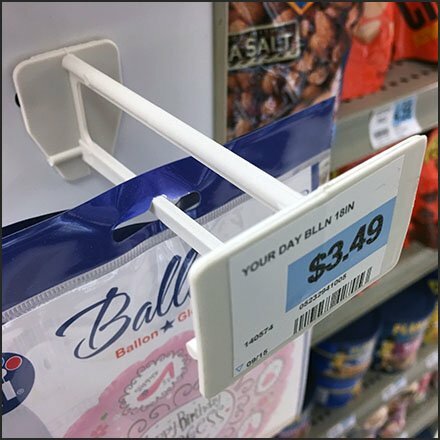 If your merchandise is lightweight too, consider something like this Helium Balloon Plastic Plate Scan Hook to save cost.